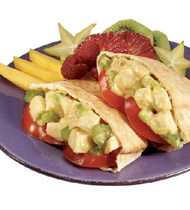 Check out our delicious chicken pita recipe using Campbell's® Cream of Chicken Soup. This is perfect served as an appetizer or side on any menu. 1 Mix soup, celery, onion powder, and pepper. 2. Add chicken. Mix lightly until well blended. CCP: Cover and refrigerate at 40º F. or below. 2 CCP: Hold at 40º F. or lower. Portion using No. 10 scoop (3/8 cup). Scoop mixture into pita halves and place 2 tomato slices in each. 1. Mix soup, celery, onion powder, and pepper. 3. CCP: Hold at 40º F. or lower. Portion using No. 10 scoop (3/8 cup). Scoop mixture into pita halves and place 2 tomato slices in each.